Can You Have Too Many Cats? now and then in an ecstasy of cushioned comfort. you have already read it." She looks up and gives me her full gaze. "Don't be ridiculous,"
she purrs. "I wrote it." ~ Dilys Laing, "MIAO"
luxuriate itself into a snoozing ball on a soft cushion. that a soul is not there. Most cats, when they are Out want to be In, and vice versa, ...simultaneously. ~ Louis J. Camuti, D.V.M. 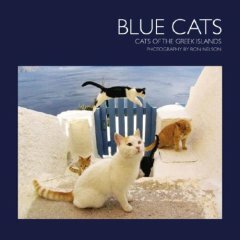 Ron Nelson's camera captures the soft details of some amazing cats living in the Greek Isles. Their fur seems to be especially healthy and their bright eyes seem to speak of happy days laying out in the sun, a life lived outdoors in the fresh air and a content spirit. Each picture is framed on a white page to bring out the contrast of the white stone walls and sapphire waters glistening in the distance. Some kittens are found sleeping on windowsills outside windows with lace curtains while others find their home in a café or wandering along sun-drenched stone walls with foliage set against a background of mountains and cooling blue waters. The photography in this book goes beyond capturing moments and has additional elements of artistic excellence. 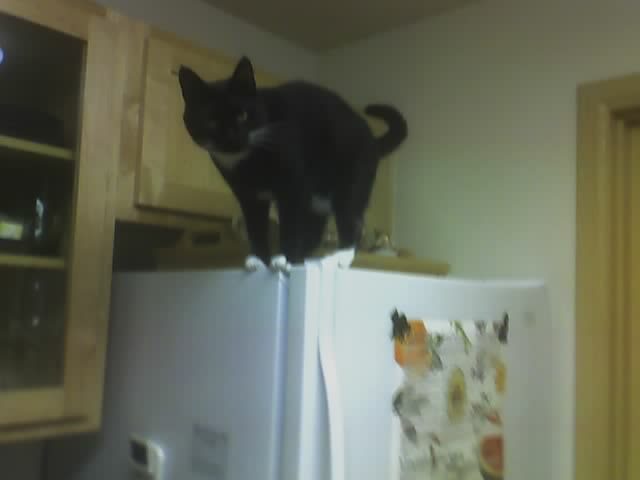 My husband has always wanted a pure black cat and the one in this book really captured his interest in a variety of pictures including the one where the cat jumps off the wall and where it looks like it is meditating or observing the view. The tiny black-and-white cat will make you laugh as it seems to have found itself atop a large white stone pillar and is quite happy to sleep the day away far from the crowd. All of the cats look especially well groomed, very pampered and happy to be living in Greece. Blue Cats is one of the most beautiful books on cats I've ever seen due to the additional artistic flair of the photography and the beyond gorgeous settings.